I’m not much for addenda (except insofar as FindingMyKid.com, by the nature of blogging, is one long series of addenda to its “About” page and initial post). Nevertheless, I simply must add four notes to Saturday’s crappy-to-happy post. We were rushing to get to the JCC by 2:00 pm. We left home ten minutes late, and then I had to take Martin to the restroom to change into new pants. It was after 2:15 pm when I finally dropped him in the correct room. Still, only one other child had arrived, out of the dozen or so who usually attend. “Small group today?” I asked an instructor. “I don’t think so,” she replied. “They’ll be trickling in.” Relieved that we weren’t the only tardy family, I headed to the library to write. I posted “From Crappy to Happy” at 4:55 pm, just in time to pick Martin up from the three-hour session. As I arrived at the door, an instructor was saying, “Okay, everyone get your coats.” Still—yes, that’s the second “still” in as many paragraphs, by design—she looked surprised to see me. One girl from the group asked, “Is Martin going home with you?” No other parents had arrived yet. The staff seemed to scramble to gather Martin’s belongings, and one had to chase us down the hall because they’d forgotten to include his art project. Did any of this strike me as odd? No. I suppose I was spending too much time in my own head, trying to keep a good attitude, planning our evening, debating whether to insist that Martin use the bathroom before we left. He was getting settled in his car booster seat when I saw the rest of his group, wearing their coats, walking along the parking lot to the outdoor playground. Because the program meets from 2:30-5:30 pm, not 2:00-5:00 pm. Because, after more than six months at the JCC, I had the times wrong. Because we never had been late in the first instance. I said, “It looks like your friends are going to spend some time at the playground. Would you like to join them?” Martin said yes. I felt pretty dopey as I walked him to the playground and explained my confusion. Sunday afternoon, Martin ate another dippin’ plate, albeit with a little assistance. 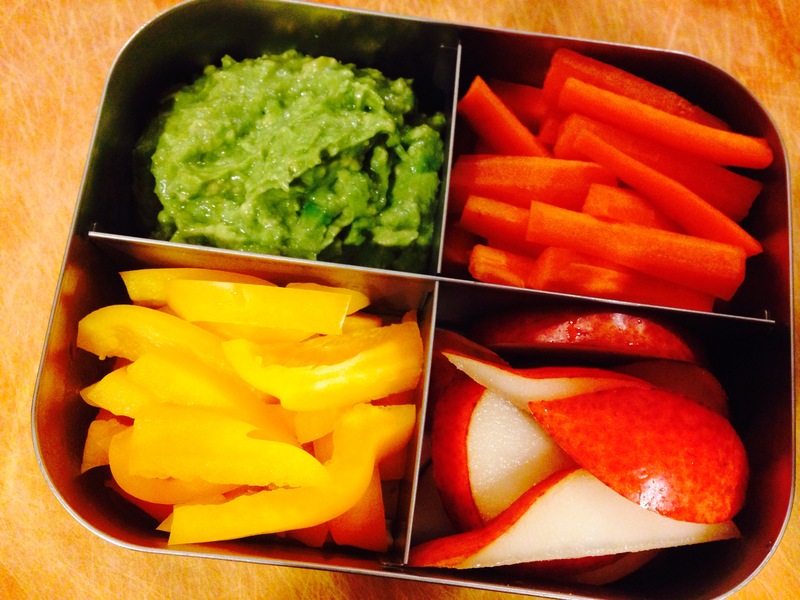 So that’s what he took for school lunch today: carrots and yellow bell peppers (included because yellow is his favorite color), dip made from avocado and fermented garlic, and a side of pear. (GAPS diet says to do fruit alone, not with a meal. Cut me some slack. I had to fill that last compartment in the lunch container, and rice crackers are out for now.) The dippin’ plate doesn’t really have protein, so he had a protein-heavy breakfast of bone broth and chicken-and-egg bread with ghee, and I sent some sunbutter treats for his morning snack. Here’s hoping the lunch container comes back empty. 4. On the way home from the JCC, late Saturday afternoon, Martin and I heard both My Sweet Lord and Heart of Gold on satellite radio. For me at least, that combination effects at least a 27.5309% improvement in mood. Saturday turned out quite well. Martin’s school lunch today: a dippin’ plate with carrots, yellow bell pepper, avocado-and-fermented-garlic dip, and pear. This entry was posted in Deep Thoughts, Diet, Motivation and tagged ASD, attitude, autism, bad days, gaps diet, good days, heart of gold, jcc, my sweet lord, recovery by findingmykid. Bookmark the permalink.